The results are in, and as of this October, SAP has been recognized around the world a staggering 136 times through various awards and rankings. We have so far nearly doubled the 72 total awards we received throughout all of 2015. These wins directly reflect the efforts and values of our Company, which we work hard to showcase. Take a look at these awards and you’ll see diversity awards, HR awards, best workplace awards, happiest employee awards, and more. SAP is blowing the competition away. Gender Diversity has been a particular area of focus this year and SAP has received an EDGE gender equality certificate in 13 countries as well as a global certification. SAP in Australia has been recognized as a top leader for gender equality by the Australian government’s Workplace Gender Equality Agency. Additionally, SAP in the United States has been placed on the Top Companies Leadership Index for Women in Tech by the prestigious Anita Borg Institute. SAP took home a massive amount of awards at the Brandon Hall Awards (17 in total) including 4 golds for Best Advance in Talent Acquisition Strategy (for Autism at Work), Best Unique or Innovative Talent Acquisition Program, Best Program for Sales Training & Performance, and Best Advance in Coaching & Mentoring. 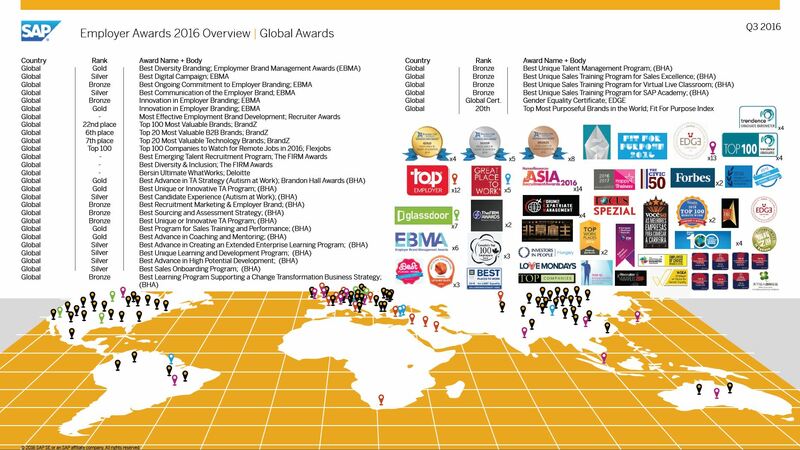 Download the FULL list of awards HERE (PDF on Global Employer Branding Jam) or else take a look at them on the Life at SAP Facebook page. Share with your stakeholders & feel proud.